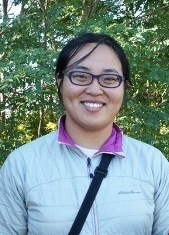 Personnel-PLai | Owl Moon Environmental Inc.
PRISCILLA W. L. LAI, B.SC. Priscilla first joined Owl Moon Environmental in 2012 as a bird bander for the Boreal MAPS team and later became a full-time Biologist in 2015. She has been involved in various ornithological research since 2006, ranging from conducting breeding bird surveys to bird banding for songbird and raptor migration monitoring and productivity/survivorship studies in Ontario, Alberta, and Oregon. Her main responsibilities includes leading crews as a Bander-In-Charge and field coordinating for the Boreal MAPS program, analyzing data from wildlife camera traps and small mammal track plate studies, conducting waterfowl surveys for the Oil Sands Bird Contact Monitoring Program, working collaboratively to produce reports and protocols, and updating the Owl Moon website.